The Blacker-Wood Library of Zoology and Ornithology was originally founded in 1920 by Dr. Casey Wood, an ophthalmologist whose interest in comparative ophthalmology led to research into the eyes of birds, and a broader interest in birds in general. Dr. Wood travelled widely, and from 1920 to his death in 1942, he was principally responsible for acquiring books, manuscripts, paintings and drawings and artifacts for the Blacker-Wood Library. Some of the collections well-known to scholars include: the Ivanow collection of Persian, Arabic and Urdu manuscripts, the Gurney reprints on crustacea, the archives of the Montreal Natural History Society, manuscripts on zoology, letters from 19th and 20th century naturalists. 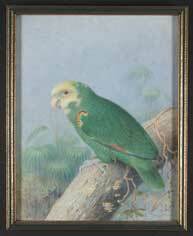 Also in the collection are over 10,000 drawings and paintings of animals, including: over 900 paintings by Charles Collins, Peter Paillou, Eleazar Albin, George Edwards and Gerhard Ehret, which were commissioned by the naturalist Taylor White; and the only known paintings by Elizabeth Gwillim - a life-sized collection on birds of India. The Blacker-Wood Library of Biology was formed in 1988 with the merger of the Blacker-Wood Library of Zoology and the Botany-Genetics Library. The collections are widely used by students, faculty and non-McGill researchers. The main collections were integrated with the Life Sciences Library in 2005, with the rare collections housed in Rare Books and Special Collections.